Wits University Campus Planning and Development Unit will begin a Gateways Project intended to upgrade the pedestrian entrances on the main campus. Entrance that will be getting a revamp are the Oppenheimer Life Sciences (OLS) steps, on Jan Smuts Street, and create the Sutton Close entrance on Jorissen Street, between the Richard Ward Building and Solomon Mahlangu House. The construction to refurbish these entrances will commence March 7 and is expect to be completed in the next four months. These entrances will be closed during this period. The objective is to improve access to the university by creating more welcoming pedestrian entrances for staff, students and visitors. “We realised that we needed to give a better experience to the students, by treating students with dignity. Wits is based in the city and we need to start being friendly and opening our door to the city in which we are placed. Wits has been very closed and concrete. If you go to the gate, you see a very strong barrier and uninviting entry. So, we relooked at how we make the edge more user friendly,” she added. Some of the benefits of the upgrade include Wi-Fi connectivity hotspot, charging points, information points and maps, lighting for security purposes, iconic and more visible signage, CCTV surveillance and universal access to accommodate users with mobile and visual impairments. Horowitz told Wits Vuvuzela that posters letting students know what is happening had gone up on February 28, inside and outside of the OLS stairs. Second-year BSc Construction Studies student Won-Hyang Muthimba was not impressed at the timing of the project. “Most of us use that entrance in the morning and to get home. In the mornings, especially in the beginning of the year the line ends at the bottom of the road. Now that they are going to build it for like four-months, they should have done it in the holidays in November, they could have finished in February. Now it’s going to inconvenience a lot of people that stay on this side or the end of Braam to come around Senate House or WAM to enter. It’s gonna (sic) take a lot of time and waking up earlier. For me it’s gonna (sic) be an inconvenience but I guess it will be worth it,” she said. Another second-year BSc Construction Studies student Thembelihle Nombewu said she is looking forward to the upgrade even though she will be inconvenienced. “I think it’s a good thing. If the end product is gonna (sic) be good then it’s worth it,” she said. 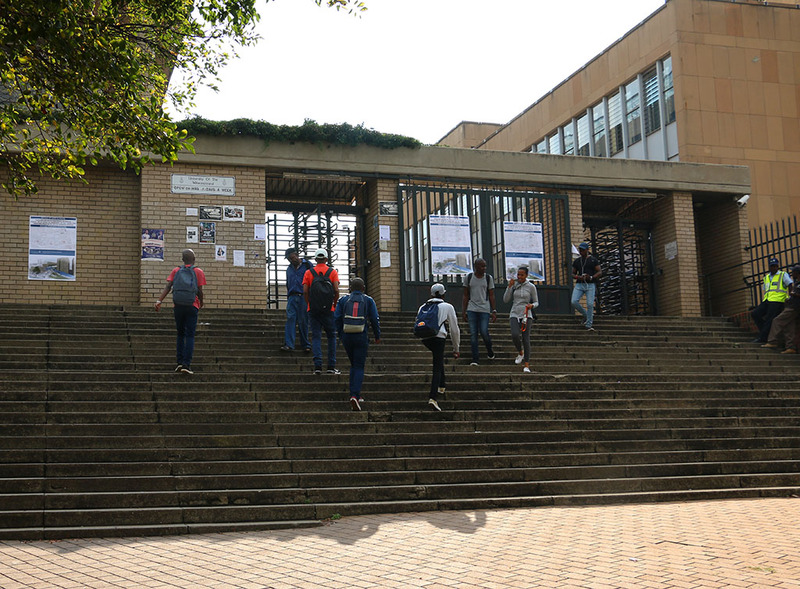 Horowitz encouraged students to use the Station Street entrance, next to the Wits Theatre as an alternative entrance and give themselves an extra 10-15minute walking time to classes.